A convenient service for those visiting Abashiri from overseas! 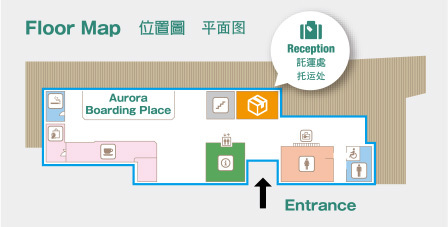 Your luggage can be delivered to the hotel in Abashiri where you plan to stay, within the same day. Service provided free of charge to the first 100 people who arrive during the above period. *Those who reside in Japan and those who request the service after the first 100 customers shall be asked to pay a fee (500 yen). having to carry your luggage. ・Credit cards cannot be accepted. ・Please do not lose the customer’s receipt you are given when you hand in your luggage, as you will need to show this in order to collect it. ・This project is being implemented by the Hokkaido Tourism Organization, the Abashiri Tourist Association and other organizations as the Abashiri Luggage-free Sightseeing Environment Improvement Verification Project – part of the Extensive Sightseeing Route Promotion Project (Okhotsk, Kushiro, Nemuro regions). This is a verification/experimental project aimed at visitors from overseas. The free service is only available to overseas tourists.Please note that those who reside in Japan will be asked to pay a fee of 500 yen for the service.